QUICK START – Play In 1 Minute or Less! 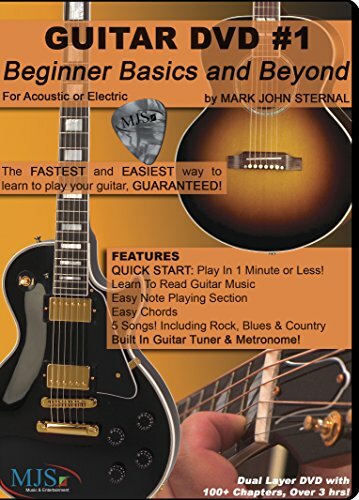 For electric or acoustic, this video gives you all you need to survive in the world of guitar! Designed to be the FASTEST and EASIEST way to learn to play, GUARANTEED! Learn to read guitar music with notation, TAB and charts. Start playing instantly! Learn individual notes then progressively build up to partial and full chords. Graduate to your first 5 SONGS in the most popular music styles including Rock, Blues and Country. BONUS FEATURES – Built in metronome and guitar tuner. Giant on-screen sheet music. The guitars and amps of GUITAR DVD #1. Over 3 Jam Packed Hours!